I've been nursing a really really sore throat these last few days, two of my children are sick with upper respiratory infections and I've been busy fighting mine off with a couple of my favourite herbal helpers. I wanted to share what I've been doing as it's an easy, effective way to deal with sore throats, colds and flu like symptoms. With this recipe it isn't crucial to be exact with your measurements, approximate is good enough. Garlic Oxymel is a potent antimicrobial as well as mucolytic, (meaning it breaks up mucous) and is fabulous to have on hand as a preventative when you know there are germs around and also good when you do have symptoms of a sore throat, stuffy nose and chesty cough. 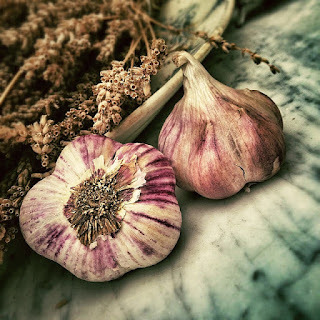 Garlic Oxymel is also a great way to use up any sprouting garlic you may have. Warm apple cider vinegar on low heat with chopped or crushed garlic and 1 tsp of desired seeds and/or chilli. After 10 minutes of very low heat decant into glass jar- leave on the bench for a few days, give it a bit of a swirl daily. Strain and store in fridge. Add 1-2 tsp to a cup of warm water and consume 1-4 times daily. You might like to add honey as the taste is strong- I generally don't as I mostly eat a low sugar diet.